In the last 25 years, 92 large whales have been freed from life threatening entanglements in fishing gear. Such entanglements are threatening the critically endangered North Atlantic Right Whale. When these whales are spotted who comes to the rescue? A team from the Atlantic Large Whale Disentanglement Network. When a call comes in, responders race to the whale’s location. They attach a GPS buoy to the whale to track its position, in case bad weather delays the rescue. Using grapples, rescuers attach buoys to the fishing gear. These floats make it difficult for the whale to dive and create drag, eventually tiring it out. When the whale has slowed to an approachable speed, rescuers begin the dangerous task of removing the gear. They cut through the netting or rope with long knives. 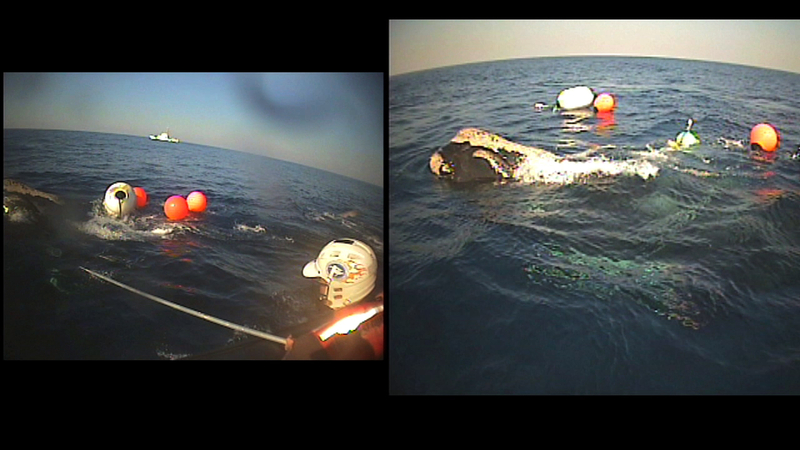 Once the gear is removed the buoys are released and the whale swims free. If rescuers can’t remove the gear entirely, they’ll cut off a portion hoping the whale will shed the rest of it as it swims through the water. Driftnets, lobster lines, and marine debris often cause these life-threatening entanglements. While new fishing gear is being designed, for now, these ocean heroes are their only hope. Whales swim 4-10 miles per hour making cutting them free a dangerous job. The majority of whale deaths since the 1970s have been caused by humans. The leading cause of death is entanglement in fishing gear followed by getting hit by a ship. Shipping lanes have been shifted away from known whale spots and migration paths on both US East and West coasts to help prevent whale ship strikes.